Tlönators are systems that translate texts from English to Tlönized English, a version of English that attempts to be executable. In “Tlön, Uqbar Orbis Tertius”(1940), Jorge Luis Borges proposes an executable language that “is a heterogeneous series of independent acts” which reflects his idea of the fictional world of Tlön — a world that “is successive, temporal, but not spatial.” In this world, nouns are expressed through combinations and accumulations of verbs and adjectives. Jorge Luis Borges describes the language of Tlön  in “Tlon, Uqbar, Orbis Tertius” as ideal for its absence of nouns. In the northern hemisphere of the world, specific nouns are expressed through combinations of verbs. Borges exemplifies this by telling us that “surgió la luna sobre el río se dice hlör u fang axaxaxas mlö o sea en su orden: hacia arriba (upward) detrás duradero-fluir luneció” [The moon rose above the river” is “hlör u fang axaxaxas mlö,” or Upward, behind the onstreaming it mooned]. In the southern hemisphere, nouns are substituted with combinations and accumulations of adjectives. Moon, for example, would be “aéreo-claro sobre oscuro redondo” [aerial-bright above dark-round]. Specific objects do not define themselves but are defined in relation to their actions or their qualities. Language in computing, in Borges’s short story, and in its world of Tlön is an active and visible mediator that connects the imaginary with the real and interfaces objects with content. It is through language that magical objects in the short story are described and that the information they embody is presented. In a similar way an executable code acts as a set of instructions that a machine follows to present data on an interface object. The following projects attempt to recreate the language of Tlön. “Tlönator: The Latest!” is a system that translates texts from English to Tlönized English, a version of English that attempts to be executable. It finds the nouns in the text and replaces them with verbs and adjectives related to them. This latest iteration of the translator project attempts to highlight the process of mediation and control, as well as the illusion of materiality of the device. The project allows the user to input text through a keyboard, look at it on a paper-white screen and retrieve a piece of paper with the translated version of her text. The translated text here is material, a piece of paper that the user can take home. “Tlönator: The Latest!” highlights the process of remediation and illusory creation by displaying the electronics of the project in a transparent box; raising questions on the transparency of digital media. However, this is solely an illusion because the processing of the text remains unknown for the user. Further more, the attention given to the devices that execute the code reminds the user of the layers of control in digital media. The user feels empowered typing her text while being trapped within the preset settings of the program, at the same time knowing that I am also trapped within the possibilities of the languages and devices I use in the project. “Tlönator” is a system that translates texts from English to Tlönized English, a version of English that attempts to be executable. It finds the nouns in the text and replaces them with verbs and adjectives related to them. 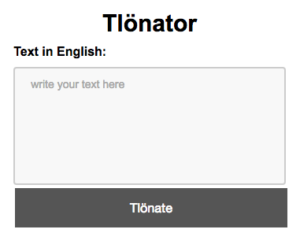 You can use the “Tlönator” here.